The aforementioned Intellivision arrived today, and my kids seemed impressed when I explained that this console was almost as old as me. My two-year old enjoyed putting cartridges in it and repeatedly bringing me the manuals, because he’s in that age where he really likes to bring people stuff. Anyway, the console itself is pretty slick looking. I can’t test it out until I get back to my office where I have the appropriate cords and a TV, but it’s a nice looking artifact already. I’m surprised how simple it looks on the outside compared to the Atari 2600, and it seems longer and larger than I remembered. The lot came with seven games, all with their controller overlays — which was a big thing that drew me to this auction. 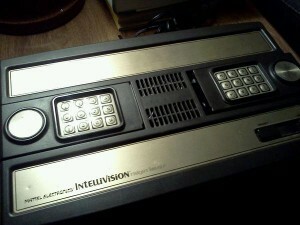 THIS IS A VINTAGE MATTLE INTELLIVISION GAME SYSTEM. THIS IS IN GREAT WORKING CONDITION. THESE COMES WIT 7 GAMES DONKEY KONG, POKER & BLACKJACK, BASEBALL, SKIING, BOWLING, SPACE ARMADA, AND LOCK N CHASE. THESE HAVE ALL THE CONTROLLER SKINS AND ALL THE PAPERWORK. THIS IS JUST A BLAST FROM THE PAST.